When the action is hot — when you need to capture more than a moment— you switch the Galaxy Tab camera into Video mode, where you can record video and audio to your Galaxy Tab. Video chores on the Galaxy Tab are handled by the same Camera app that takes still images. The secret is to switch the Camera app into Video mode. Start shooting the video by touching the Record button. While the Tab is recording, the Shutter button changes to the Stop button. 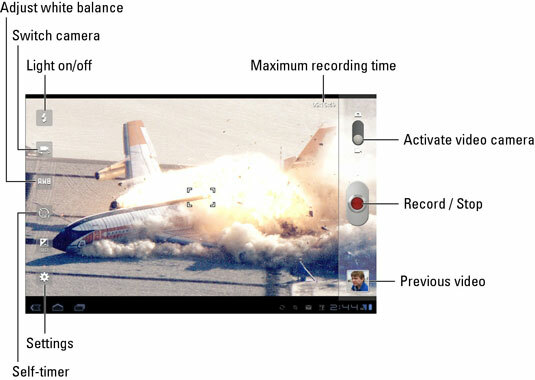 A time indicator appears in the upper-right corner of the screen, telling you the video shot duration. Hold the Tab steady! The camera still works when you whip the Tab around, but wild gyrations render the video unwatchable. The Camera app restarts itself in video mode if that was the active mode when you last quit. The video’s duration depends on its resolution as well as on the storage available on your Tab. The maximum recording time is shown on the screen before you shoot. While you record, elapsed time appears. As with the single-shot version of the Camera app, there are no zoom controls for shooting video. Visual effects (the cheap kind, not the Hollywood CGI kind) can be applied to the video. Touch the Settings button and choose Effects. Recorded video is saved in the Tab’s internal storage.